Imagine tasty almonds blended into a perfect texture and then presented to you in the form of a thin Katli. Now you can stop imagining it because it is only a click away from you! Packing the goodness of badam(almonds) in the form of this tasty sweet, this is as healthy as a sweet can get! Jay Hind sweets is a famous manufacturer of sweets from the western state of Ahmedabad and their sweets always live up to their immaculate image! Swap your unhealthy sweets and snacks with badam Katli today to take a step towards a healthier you! 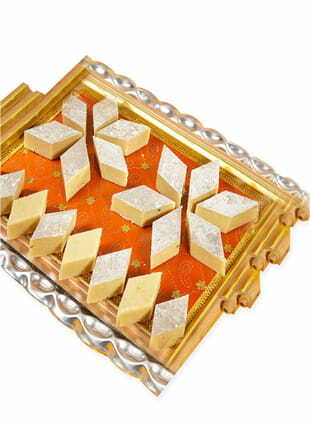 Order Badam Katli online from FoodFeasta.com today!